In it, Stephen Dubner grills Steve Levitt about a new project called Freakonomics Experiments. (Levitt blogged about it here and stopped by Marketplace last week.) The basic idea is to learn more about how people make decisions, especially when they’re on the margin. So: if you’re struggling with a decision, large or small, you can bring your question to FreakonomicsExperiments.com [DEFUNCT], where a random coin flip will help solve your dilemma. You also become part of the scientific experiment by taking follow-up surveys and letting the research team know how the decision turned out. LEVITT: So many people said, “Hey should I quit this?” or “Should I do that?” And how would we know? I mean, we have no idea, we don’t know these people, we don’t know anything about them. There’s no way we could give an intelligent answer to that question, but it got me thinking. And really what’s the best we can do is we can give people who are having trouble deciding a framework for thinking about those decisions. And in certain circumstances, maybe we could do some experiments which would both help us and our research and also help the people. LEVITT: What I hope to learn is whether or not there are any maybe big, systematic rules that we could tell people about decision-making. So for instance, it may just be the case that people rarely make the big changes, but the people who make the big changes are much happier in their lives after they make those changes. So there’s a status quo bias. So let’s just say over thousands of people making real-world big decisions we find that the changers, the ones who shake up the status quo, do better. Well if that’s true, then that’s a really important message, because what that means is whenever you’re on the margin, you should have a default rule, which is I go for the change. Okay, do I know that will happen? I have no idea. It could be just the opposite. It could be that we should never do any big changes, we’re always better off leaving things the way they are. We might learn that as well. But it’s the fact that I have no idea what the right answer is which gets me so interested in going out and for the first time trying to measure this and learn about it. You’ll also hear about the study’s design, what kinds of questions you can’t ask the coin, and why this whole idea isn’t quite as ridiculous as it sounds. This is why this experiment won't work. Those whose coin toss comes up against what they "suddenly know what you are hoping for" do not sign up, biasing your pool. I heard on some podcast or the other, maybe even yours, that the best way to make a decision is to toss the coin and if the result makes you happy go with and if it doesn't then go with the opposite. Basically, it seems to me, that it is a way of clarifying how you really feel and which way you really want it to go. So if I am trying to decide which movie to go to and I am disappointed with the coin toss that it means I really wanted to see the other movie more. Levitt, if your free service of assisting people through life altering decisions by merely flipping a coin shows to have positive outcomes, you may put a lot of psychological counselors out of business. You will be reducing our GDP! So as an economist, how does that make you feel? Still want to proceed? Let’s flip on it! Seriously though, can’t wait to see how your experiment turns out. Funny thing about those life altering decisions, especially the ones where you make lists and seek advice and make reasoned arguments for and against the impending decisions is that after all that work they go with the reasoned even if they hate it, where they could have saved time by just going with a coin toss where they accept the decision of the toss even if they hate it. Oh and there are those that feel that putting psychological counselors out of business isn't such a bad thing. People would be better off if they visited a philosopher. Listened to the podcast and i have a hard decision: what if it's a company? I'm tired of running it and I don't think I can sell it, should I just close down and tell everyone sorry, find another way to earn money? It's not a lot, a few dozen people, but still. Offer it to the employees to buy.. sell it to them for a reasonable price, which can be low since you don't think you can sell it anyway... but to just shut it down if its a going concern.. seems wasteful. several years ago,I read a business book,from one of the gurus,.._-I cannot recall if Peters,or Drucker!-....on it ,it was told that a group of arqueologists exploring far from "civilization" group,.were told that the best place for hunting was decided by the bones of animals and famed dead hunters of the tribe.Well,they prepared fire,and in the middle of the singing,and some dancing,.invoquing spirits,the bones jumping in the fire were "read",by the oldest of the men.He ,then decided what place to go for food. The scientific explanation,was that since the bones jumped at random,the hunters never repeated and anihilated animals in a single area.Also,the animals didnt recognice the odors of the humans,then were easy to cature or kill.But the most important ,was the fact that since the decision was made by spirits,there is not an incompetent ,.or "too old", boss to blame in case the tribu suffers from lack of food. Funny, it gave me the answer to stay for the next 3 months, ok, that was actually a little to close for my plan to leave ( I'm have having help from my parents to leave - you can guess where this is going here) so No was the perfect answer. The actual plan was about 6 months instead. It settled any forethought of 'rushing it'. Weird. Reminds me of one of the most entertaining novels I have read on chance, 'The Diceman' by Luke Rhinehart; if you really want to court chance then a die provides more options than a coin! It seems to me this experiment has a lot more to do with "free will" than with economics. I believe it is our ability to self-reflect that gives us the ability to make choices. Weighing my satisfaction level in a given situation is far more gratifying than leaving it to chance. I simply don't think I would be satisfied with making a decision based on a coin toss. I agree with Steve (second comment) that if the experiment is only measuring the outcome of those who went with the coin toss it will be bias. There may be something to the idea of sudden clarification when the coin is in the air. In which case, it seems that the experiment could measure both those who went with the coin toss, and those who had a moment of clarification when they saw the outcome of the coin flip and decided to go the opposite way. In other words, did the flip of the coin make a difference? I can see why this would also not work... people have to have something at stake, or else the coin toss won't mean anything. This brings me back to my original thought... I don't think I'd be satisfied with allowing a coin toss to decide my future. I'd answer "no" to the question posed at the top of the page. What a great thought experiment, though -- I love stuff like this! I actually decided which college to go to via coin. Oddly enough, I met a good friend at the school who did the same thing. 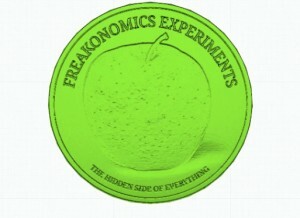 Once there, after reading Freakonomics, I decided to switch my major to econ and never looked back. Someone smart is going to pull out a two-headed coin. Legerdemain! If that is the case, they don't need the coin anyway, they already know what they want. Most decisions, however, don's start dichotomous. There is a whole process before people come to that point. Because isn't there always a(n) (third, fourth, ...) alternative? In the process of coming to a decision, a lot of alternatives already have been consciously or unconsciously discarded. What I want to say is that this experiment will be focused on the last phase of the decision-making process and leaves the other steps unstudied. Won't the problem then be that, if it turns out that people regret the choice they made (or better: that your coin made for them), you will not have a clue as to why that is, because the other (already discarded) alternatives are unknown to you. (cf. Schwartz' Paradox of Choice: the chance that you are going to have regrets about a choice rises with the number of alternatives you did not choose for). Very well put and thought-provoking ideas. I think that is why I would have such a hard time allowing a coin toss to decide my future... there are so many nuances that get missed with a "this or that way" choice, though I could not have articulated it quite so well. Tweet @ficklehand with items separated with "or" or the pipe character ( "|" on your keyboard) and it'll reply with a decision for you. Details at the link above.